Frenglish Thoughts on Blogger: Realize the dream of a new life in France? Realize the dream of a new life in France? 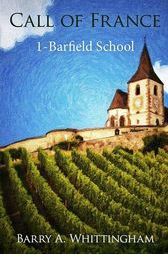 The first novel in the trilogy, CALL OF FRANCE, Barfield School explores the thoughts, feelings and motivations of Michael Morgan. Disappointing academic results, a disastrous first love and a failed job experience have all gone to make Michael feel he hasn’t yet found his way in life. He decides to train to become a French teacher. But at his parents’ home the atmosphere is poisoned, school life soon becomes tedious, and his unfortunate handling of relations with two female colleagues leads to disturbing repercussions. He longs to wipe the slate of his past clean by realizing his dream of starting life afresh in France. But he’s also tempted to stay in England and develop an exciting business venture. Which should he choose? Wouldn’t both allow him to escape from the tensions at home and school to a more fulfilling life? Or is he simply running away from himself?